White-shouldered Ibis occurs in several protected areas including Kulen Promtep Wildlife Sanctuary, Lomphat Wildlife Sanctuary (documented breeding population), Mekong Ramsar site, Ang Trapeang Thmor, Seima Protection Forest, Srepok Wilderness Area (part of the Mondulkiri Protected Forest), Bengal Florican Conservation Areas, Cambodia, and Xe Pian National Protected Area (NPA), Lao PDR. It is depicted on public awareness material distributed in Lao PDR and Cambodia. The species is considered to be the most threatened large waterbird in South-East Asia and was a priority species during the designation of Cambodian IBAs and priority areas for conservation in the 'dry forest ecoregion' of South-East Asia (Tordoff et al. 2005). Research has been conducted into the species's nesting ecology in Kulen Promtep Wildlife Sanctuary and PhD research (2008-2012) studied the value of traditional land management and the species's foraging and nesting ecology, focused primarily on Western Siem Pang, Cambodia. Nest protection schemes with incentives to local people for finding and protecting nest-sites along the Mekong central section, in Western Siem Pang and Lomphat Wildlife Sanctuary have been established. A community-managed ecotourism initiative has been established at Tmatboey incorporating nest finding and monitoring, as well as an agricultural certification scheme known as "Ibis Rice". On 9th May 2016 Prime Minister Hun Sen signed a sub-decree declaring the new Prey Siem Pang Lech Wildlife Sanctuary, which covers about half of the Western Siem Pang IBA (65,389 ha), while the Protection Forest designation for the remaining 66,932 ha was upgraded to Wildlife Sanctuary status, a key part of BirdLife's Preventing Extinctions programme that has been implemented by the Species Guardian. This has been achieved through a concerted programme of lobbying and community awareness raising including producing and distributing a poster about the international conservation importance of Western Siem Pang, placing large information boards in five key villages informing local people about development plans and threats to their land from proposed concessions and working closely with the Forestry Association and Ministry of Environment in Cambodia. Research and monitoring continues to be carried out, focusing on the foraging ecology of the species, nesting and flock size at roost sites and examining the value of trapeangs to the assemblies of waterbirds at the site. Pilot conservation work to deepen two key trapaengs in 2015 provided habitat for longer through the dry season and 15 further trapaengs have been deepened in 2017-18 (BirdLife International unpublished report). A Local Conservation Group at Western Siem Pang has been supported since August 2007, and conducts monthly patrols to the most important trapaengs to record key species and any illegal activities. A Site Support Group is being established in Lomphat Wildlife Sanctuary in order to support management, protection and monitoring at the sanctuary. In 2009, one chainsaw, 6.834 m3 of luxury wood, four guns, and one ox-cart were confiscated and destroyed in Western Siem Pang as result of information provided by the patrol team (BirdLife International unpublished data). Coordinated roost counts have taken place in the wet season since 2009 (Wright 2012, BirdLife International Preventing Extinctions Programme). Continue monitoring the known populations in Siem Pang, Northern Plains, Mekong channel, Lomphat Wildlife Sanctuary and in other parts of its range using coordinated roost counts (Wright 2012). Establish a species working group to assist coordination and cooperation between conservation stakeholders, as well as researching the ecological requirements of the species in the wet season, the impacts of the human harvesting of amphibians and the value of domestic livestock grazing in areas of low-intermediate livestock density (Wright 2012). Conduct further surveys in Borneo, central, northern and eastern Cambodia and the Satay area of Viet Nam to quantify remaining populations, only in areas where conservation intervention is considered reasonable and there are grounds for considering a significant population might be found. Focusing on areas close to settlement with traditional rice cultivation may be more productive than for core areas of remote forest. Establish further protected areas or integrated conservation development projects covering landscape-level habitat tracts supporting populations, particularly in northern Cambodia, the Mekong channel and along the Mahakam river, East Kalimantan. Enforce strict protection at important sites. Promote widespread conservation awareness programmes aimed at reducing wetland disturbance and large waterbird exploitation in Indochina. Engage with the agro-industry sector regarding the management and use of concession lands (Wright et al. 2013b). Pseudibis davisoni now occurs in northern and eastern Cambodia (c. 87-95% of the global population) (H. Wright in litt. 2012), extreme southern Lao PDR and along one river in East Kalimantan, Indonesia. It was previously widely but patchily distributed across much of Thailand, Lao PDR, south and central Vietnam and Cambodia, parts of Myanmar, Kalimantan (Indonesia), Sarawak (Malaysia) and south-west Yunnan, China, but has declined dramatically during the 20th century. It is extinct in Thailand and there are no recent records from Myanmar; and it has been described as the most threatened large waterbird in South-East Asia based on the widespread declines observed (Tordoff et al. 2005). It is almost certainly extinct as a breeding species in Viet Nam and now only occurs as a rare non-breeding visitor. In Cambodia, significant populations are known from Western Siem Pang (491 individuals counted in the 2015 census [BirdLife International, unpublished data), Lomphat Wildlife Sanctuary in Ratanakiri (at least 242 individuals counted in September 2011 [Sum P. and H. Wright in litt. 2012], but fewer than 60 counted in 2017 [BirdLife International unpublished data]), and along the Mekong river channel between Kratie and the Stung Treng towns, with 124 individuals counted along the central Mekong in October 2010 (Sum P. and H. Wright in litt. 2012), and around 150 recorded during the national coordinated census to 2017 (BirdLife International unpublished data). 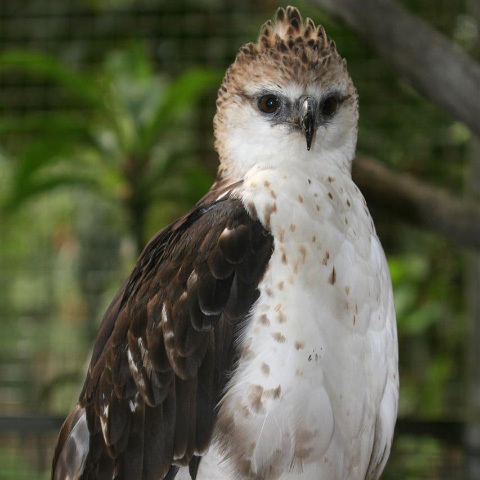 In 2009, 13 nests were found in Western Siem Pang, seven successfully fledging a total of 14 chicks (V. Bou in litt. 2009), increasing to 30 nests in 2011 with greater search effort (H. Wright in litt. 2012). Tmatboey, in the Northern Plains, Cambodia, supports a small breeding population (up to 5 nests per year) with a maximum of 39 individuals recorded in the wet season (H. Wright in litt. 2012). Additional groups (1-10 birds each) have been recorded elsewhere; along the Mekong between Stung Treng and the Lao PDR border, eastern Siem, Pang district, the south-eastern shore of the Tonle Sap lake, Rovieng (Preah Vihear Province), Srepok river, Seima Protection Forest (Bird et al. 2007) and the O Te lowlands, Mondulkiri Province. Further birds may yet be found in Kompong Cham province along the Mekong (R. Timmins; T. Clements, in litt. 2007) and around the edges of Phnom Prich Wildlife Sanctuary and Mondulkiri Protected Forest. Counts at Western Siem Pang IBA have increased since 2003, but this is most likely due to increased survey effort and improved monitoring protocols at the site (R. Timmins; T. Clements in litt. 2007; H. Wright in litt. 2012). In Kalimantan, the population at the main locality along the Mahakam River was estimated at 30-100 individuals, but recent studies reveal a decline following extensive El Niño Southern Oscillation (ENSO)-derived forest fires (Sözer and Nijman 2005). The Indonesian population was estimated at 30-100 individuals but has apparently declined (Sozer and Nijman 2005). Nationwide coordinated surveys for the species in Cambodia recorded a total of 973 individuals in 2013 (Anon. 2013). The global population is therefore estimated at at minimum of 1,000 individuals and 670 mature individuals. This species has declined as a result of habitat loss, through logging, widespread piecemeal clearance of lowland forest, conversion of wetlands for agriculture (most of the Mekong floodplain in southern Lao PDR has been converted to rice-paddy) and agro-industrial and infrastructure development (BirdLife International 2010). The proposed Lower Srepok 3 Dam is expected to cause the flooding of a large area of Lomphat Wildlife Sanctuary (BirdLife International 2010), and the Xavaburi Dam in Lao PDR is expected to disrupt habitat in the Mekong River channel (Wright et al. 2012). Logging, the encroachment of plantation agriculture and settlement through the granting of economic land concessions is a significant and widespread threat, affecting all of the four largest known populations at Western Siem Pang IBA (BirdLife International 2010), Kulen Promtep and Lomphat Wildlife Sanctuaries and the dry forest around the Mekong River channel (Wright 2012, H. Wright in litt. 2012). In September 2012, more than 40% of the individuals recorded were found in roosts that were inside economic land concessions and more than 15% were within 5 km of a concession boundary (Wright et al. 2013b). Habitat loss has been compounded by hunting of adult birds, eggs and chicks for food, and disturbance, leading to the loss of secure feeding, roosting and nesting areas (Clements et al. 2013). Hunting pressure is exacerbated by the fact that their primary habitats appear to also be a focus for people: large rivers, forest pools and grassland/field complexes with high densities of ungulates and domestic livestock. However, hunting may now be less of a threat in Cambodia following education initiatives and the confiscation of weapons (H. Wright in litt. 2008). However, poisoned baits set for hunting continue to affect some populations (Wright 2012). In addition, hunting may not be a serious threat in East Kalimantan, but fishing through poisoning and electro-fishing may negatively impact the population there (Sutrisno and Imanuddin 2002). Recent evidence suggests that forest fires in Borneo resulting from an El Niño Southern Oscillation (ENSO) event shifted the distribution of this species to unburnt stretches of rivers (Sözer and Nijman 2005). 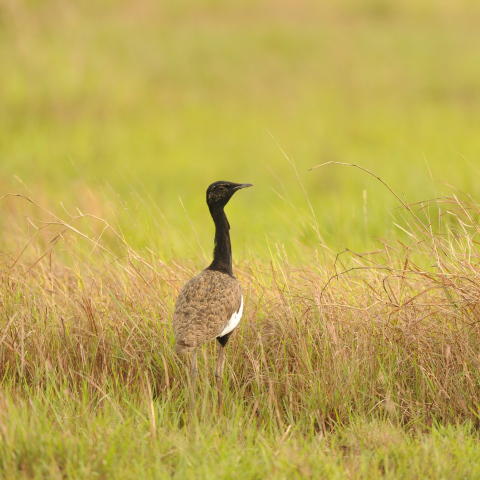 There is considerable evidence that the species is associated with large ungulates in South-East Asia, which create and maintain the short-sward grassland feeding areas that the ibises depend upon within the dry forest landscape (T. Evans pers. comm. 2006). Hence, the demise of wild ungulates within the region may have catalysed its rapid decline resulting in few remote refugia for the species (R. Timmins; T. Clements, in litt. 2007). Moreover, its dependency on herbivore-altered habitats means that remnant areas are close to people and associated with domestic livestock, making it more vulnerable to human-induced habitat modification (R. Timmins; T. Clements, in litt. 2007), and a large proportion of the population occurs outside of protected areas (Wright et al. 2012). 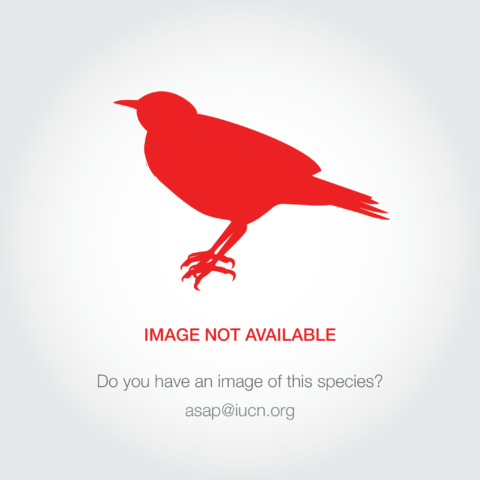 Of 609 individuals counted in 2011-2012, more than 80% roosted outside protected areas (Wright et al. 2013b). Probably the most significant threats currently come from land concessions for logging or plantations, and infrastructure development such as dam construction, which threaten even those areas that currently have protected status (Wright et al. 2013b).